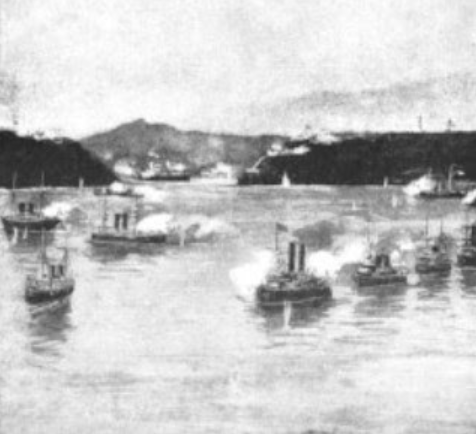 The Naval Battle of Santiago de Cuba. With the possibility of being captured in the harbor if Santiago fell to the U.S., the Captain General of Cuba, Ramon Blanco, ordered Admiral Cervera’s squadron to fight their way out. Blanco said: “If we should lose the squadron without fighting, the moral effect would be terrible both in Spain and abroad.” On receiving the fateful order from Havana to fight, Cervera recalled his officers and sailors who had been in the trenches to ready the ships for the encounter with the American battle fleet. No one fit for duty missed the roll call. They realized the odds and did not fail. Early on July 3, 1898, the Spanish officers and sailors completed their assigned duties for battle. As it was Sunday, chaplains on every ship, held mass including communion. For over three hundred of them, this became their last communion. After several weeks on blockade duty, the Americans were going about their Sunday routines when the guards saw the Spaniards moving out into the channel ready to do battle. The alarm gongs sounded for action. Up went the signal flag. “Enemy ships are coming out” a half-hour before Admiral Sampson, on the New York, had left the fleet for a meeting with Shafter at Siboney. Upon hearing the roaring guns, he ordered the New York back to join the fight. The Maria Teresa came out at full speed and received the brunt of the U.S. Navy guns. It caught fire and ran aground. The Oquendo was badly damaged and went ashore. Vizcaya was hit by the shells of five American ships and veered toward the beach, where it exploded. The two destroyers were swiftly sunk, but Colon, the best of the Spanish cruises, turned away until it ran out of her good quality coal. Colon lost speed and was shelled by the Oregon, Brooklyn, New York and Texas. By 1:15 p.m. she headed toward the coast near the Turquino river and surrendered. Three hundred and twenty-three Spanish officers and sailors were killed and 151 wounded. The Americans lost one sailor. A decisive victory. Admiral Cervera was picked up by a crew from the U.S. Navy Gloucester and transferred to the battleship Iowa, where Captain Robert Evans greeted him with respect and courtesy. A marine honor guard saluted the defeated admiral, as a tribute to the courage of the Spanish sailors. Later, Cervera and several of his captured officers were taken, almost as guests, to the U.S. Naval Academy of Annapolis in Norfolk, Virginia, where they spent their captivity until the end of the war. It was a time when heroism and honor had a superlative meaning. For Spain, the war in Cuba was lost. The long, painful agony of her decrepit empire was over. With her navy sunk, the army isolated in the island and neither cash nor credit to keep on the fight, Madrid needed a negotiated settlement. It came quickly. OnJuly 16, Santiago capitulated, and peace negotiations began in Paris, were on December 10, Spain signed a treaty transferring possession of Cuba, Puerto Rico and the Philippines to the United States.